Whatever the reason you need your logs blasted, completing the task with care is the key to making it look great. Sandblasting and cob blasting are important tools in log home restoration… but let’s face it. That’s not the real reason you have it done. It’s because the stain is faded or the finish is starting to peel or because no stain or sealer was ever applied and the logs are getting blackened or gray. In other words, your lovely old log home is looking sad and shabby. But there are even more important reasons to do this… logs need to breathe. And if there are too many layers of old finish on the logs, they can start to retain too much moisture and that’s the beginning of rot. Here is an explanation of the whole process of stain and paint removal by blasting……. Sometimes, hidden problems are revealed when all the old finish is removed. This makes it obvious which damaged logs need to be repaired or replaced. Edmunds & Company likes to use a natural and non-toxic borate preservative to protect the logs before we apply a new stain to reveal the beauty of the logs and remind you why you fell in love with the place. To learn more about the borate treatment we use, click here for information about the PeneTreat brand boron preservative. Sand blasting log cabins can reveal the hidden beauty under dark or stained logs. Oftentimes, log cabins and log homes darken from mildew, built-up stains or improper sealing. Cob blasting log cabins can remove unsightly external discoloration to reveal the true beauty underneath. After blasting, we use non-toxic borate preservatives to treat the logs before applying new stain. The result is a home preserved and protected from the weather. A refinished home is beautiful and adds to its value for generations to come. Sandblasting is an effective method or removing old finish. Done by a professional, it can leave the logs in good shape, ready for staining. 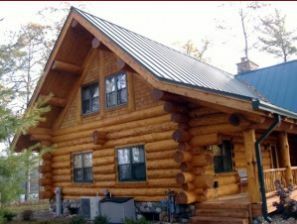 This log home is now looking good, its logs can breathe again, and it’s protected from the elements. Don’t trust just anyone with the refinishing of your log home. Edmunds & Company has over 40 years of experience doing this work. We can return your home to its original beauty. 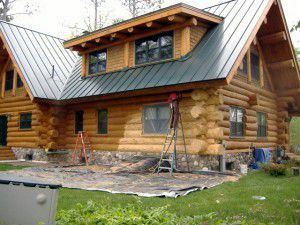 It is important to have your log home refinished by a company that has experience and commitment to customer satisfaction. Call Edmunds & Company for an estimate at 715-373-5744 or contact us.